It’s the 4th Blog Birthday of Shanaya Tales, and so I am here with a very special announcement. As some of you may know, earlier this month, I shared my desire to revamp the Shanaya Tales email newsletter. Well okay, I don’t think I can call it a newsletter, not in the form it existed at any rate, since it was basically automated post update notifications being sent out to folks who had opted in to receive them. BUT that is changing. I have disabled these automated post notifications. And as promised (in my email to the current subscribers), starting February, I am going to send out a personally written bookish newsletter every single month. Now this is clearly something I haven’t ever done before, so even just writing this here makes me kind of nervous-excited! But I guess I am more excited than nervous, so it’s all right? Anyway, so like I was saying – it’s going to be just one email/bookish newsletter per month, which is going to be sent out on the First Friday of every month (except this first month when it will be sent on the second Friday, the 8th), and will revolve around all things bookish – from the latest bookish news, to views from the fun bookish corners of the internet, as well as bookish resources & reviews. And I know there is still a week for this to go live on Friday the 8th. But honestly, I cannot tell you how excited I am for this to be a thing already, because it’s been super fun working on it in the back-end, figuring out all the big and small details. Actually, I am still working on some of the small details, but today I’m sharing with you a glimpse of what went behind the bigger things, like picking a name, and deciding on the content. Especially because I would love to know your thoughts and opinions on these things. So right when I decided I was going to start a bookish newsletter, I knew it had to have a name. I know, I know, email newsletters do not need names. But hey, it’s me, I like books, and naming stuff. So bear with me, please? That being said, while I might like naming stuff, I am not necessarily good at it. The first couple of names I came up with were Bookmark/Bookmark IT (predictable I know, I told you I wasn’t good at this! ), as in this newsletter I intended to share the bookish highlights of the month, the bookmarked stuff, so to speak. But eventually the original two names were discarded, because I liked the variation Bookmarked more, so that’s the name I settled for. Now I do realize it is quite literal, and not necessarily original, but hey, I do need (fine, want!) a name, and until I get hit by a new stroke of inspiration (or you lovely bookworms suggest better names) this one stays. Oh and I actually even created a banner of sorts, designing it after a bookmark. Please tell me how you like it? Once the name was sorted, the next thing to figure out was the content of this newsletter. Of-course this is just the kind of thing that most likely will be tweaked along the way, but I had to start with something, so I based this on what I personally liked in an email newsletter. And as far as I am concerned, I only really subscribe to/and read newsletters that do provide value but are relatively short, quick reads that can be read/scanned in about 5 minutes, and possibly include links pointing towards the more detailed stuff, that I can check out if I have the time and inclination to read more. So that is exactly what you can expect from Bookmarked – A quick, hopefully informative, definitely fun bookish read that you can scan under 5 minutes to stay updated on some of the latest from the book world. And if this sounds like something you’d be interested in, please do SIGN UP here, if you haven’t already! I’d love to have you join in! That’s all from my end, folks. It’s been an amazing 4 years. Thank you for all the love & support you have shown me over these years. The friendships that I have made in the blogosphere have been one of the best by-products of blogging, and if for nothing else, then just for that alone, I am glad that I worked up the courage to hit publish on that very first post all those years ago. Oh and finally, before you go.. I have one last announcement. To celebrate 4 years of Shanaya Tales, and as a thank you to all my lovely readers, I am hosting a GIVEAWAY on Instagram. There’ll be more details over on Instagram, but here’s a hint: It involves one of the most successful books of the decade, so you may not want to miss it. Check it out here! Signed up already and waiting for the newsletter. Shanaya Tales recently posted…Of Blog Birthdays, Exciting Announcements, and Giveaways! Ill sign up and loved the design and logo. Very good work, making and colors there. Great job! Congrats on the milestone. It’s a big one for sure. Thank you so much, Parul. I truly appreciate it! Congratulations on 4thversary and many more to come. excited to join. signing up for bookmarked. All the best on the giveaway!! Thank you so much, Maya. I just sent the first Bookmarked out now. I would love to hear how you found it. Congratulations shanaya. I think I already signed up for the newsletter earlier but did again to be sure. Good luck and many years of happy blogging. Signed up and loved the name and logo!! All the best Shantala. 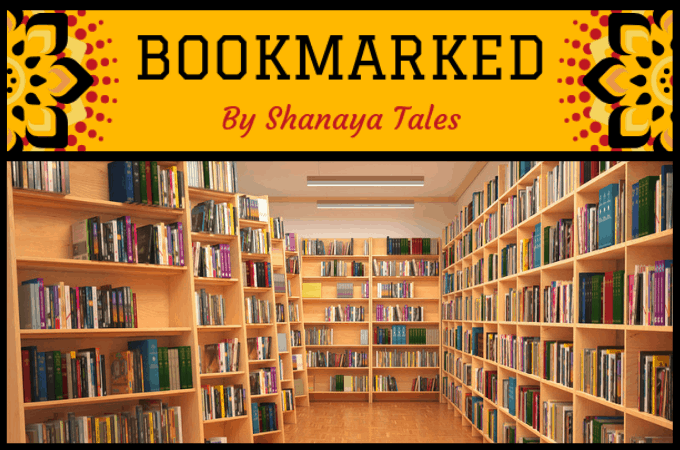 I have signed up for ‘Bookmarked’ and Shanaya Takes is definitely bookmarked in my blog reading list. And yes I am definitely participating in the Insta giveaway. Hoping to win. All the very best in your blogging journey for the future. Bookmarked is an apt name!! You are good at naming! Thank you so very much, Aesha. I think your sign up did not come through. Not sure what’s the issue. Let me know if you want to try signing up again. Entering the Giveaway! Michelle Obama is a very inspirational person, someone who many look up to. I strongly believe that her new book is something special and that we can learn a lot from it! Congratulations on the 4 years! I loved the name and the design. It is perfect. Wish you the best! Wishing you the best with the Giveaway!! Oh yay! Congratulations. You’ve done well in four years Shantala. I love your space here. Congratulations on the news letter. Looking forward to it. I like the name – straight and to the point. But then I’m terrible with names – my book blog has the most silly and cumbersome name and I’ve been thinking of changing it but haven’t been able to come with anything at all! PS: I tried to sign up for your newsletter but it gave me an error saying ‘I was already signed in’. So there :-). Thank you, Tulika! And hey, your blog name is quirky, but not cumbersome at all. And you know I love the space! It’s one of my favorite book blogs that I love to binge read! Congratulations Shantala… and signed up and entered giveaway too :)..
Congratulations on completing 4 years of blogging and all the best for your newsletter. Bookmarked sounds apt to me since it will be about books and bookish stuff. The banner is attractive. I have shared your Instagram giveaway post within my limited circle. Congratulations! Entered the recent giveaway. Thank you, and all the best! Congratulations on turning 4! Wishing you many more! I love the name, ‘Bookmarked’ and the logo as well. Great job! Thank you so much, Mayuri. Truly appreciate the feedback! Happy anniversary, Shantala! All the best in all your future endeavors (so archaic, I know, but feels good to say it!) The newsletter graphic looks good and I am sure you will do a great job on it! Thank you so much, Vidya. Archaic or not, I know it is heartfelt, so thank you! Hugs. Thank you so much, Vinitha. I hope you enjoy Bookmarked! Thank you for all the love! Hugs. Congratulations on your 4th blog anniversary, Shantala. here’s to many many more. Bookmarked is apt and looks cool too. Looking forward to your bookish newsletter. Cheers! Bookmarked sounds so good! I can’t wait for the first news letter! Thanks for the chance to win! My bookstagram is j.g.reads for the giveaway. Absolutely fantastic! Love the name and logo 🙂 Super excited to receive your bookish monthly mails! Thank you so much, Aditi! How did I not know earlier? I am signing up right away and I have missed one mail already. Happy Blogversay and I love your blog! Keep doing YOU!